a sentence onto two separate lines, for no apparent reason? Why would I do that? Maybe I did it to confuse you. Maybe I’m deliberately trying to surprise or annoy you, so that you’ll feel invested enough to read the rest of my article. Perhaps I’m trying to establish myself as an unreliable narrator, giving me license to pull all kinds of tricks on you throughout the remainder of this article. Or maybe I unexpectedly split a sentence onto two separate lines in order to illustrate the power of eye movement. Let’s take a look at two more examples. Consider poetry. If you open a book—any book—you’re likely to find inside the exact same visual pattern regardless of length or genre. You’ll see an indentation on the first line of a paragraph, a series of neatly justified lines of a consistent width, and then a hanging line which, along with the slightly increased spacing and newly indented line below, indicates the end of a paragraph. Did you notice how I included a dash? The first sentence of this article gave your eyes no warning, and allowed you to “stumble forward” unexpectedly onto empty visual space. But now, by priming you with a paragraph about poetry, telling you specifically to expect a haiku, adjusting line spacing and indentation, and including a few horizontal pixels, your brain reprogrammed your eyes to move in an entirely new way. After reading the second line, I’d venture that your eyes moved down to that third line of the haiku much more smoothly than in the opening line break. Consider the middle sentence. Now, grammatically, this sentence is completely correct. The reason you were led “down the garden path” initially is simply because your mind accepted “the old man” as the subject of the sentence, only to subsequently find that this phrase includes both noun and verb. The addition of a single, nine-letter word changes the meaning only slightly (from a plural to a singular noun), and yet the physical experience of the eye’s movement across the screen is dramatically altered. So now that I have your attention, let me tell you why this all matters. My goal was to convince you of the inherent value of eye movement as a marketing paradigm, not by using facts or figures, but instead by connecting you on a personal, experiential level to the fascinating science of eye movement. Quite simply, I’m advocating that marketers should take eye movement seriously. Marketing contains a host of different conceptual paradigms. There’s supply and demand, there’s promotion and distribution, there’s brand management, there’s segmentation and strategy, and now, of course—as if all this wasn’t enough—there’s digital marketing and social media. All of these different perspectives are valid and important to consider. They are each a part of a whole. But another, equally valid piece of this complex puzzle is the simple fact that marketing, particularly web-based marketing, comes down fundamentally to the consumer moving their eyes across a screen. I believe that the movement of the eye is the most fundamental physical unit of marketing. It seems logical, then, that in a field dedicated in part to “catching” the consumer’s eye, it would also make sense to measure how successfully the eye is “caught.” Marketers need a way to know whether or not the consumer did in fact direct their attention where it was meant to be directed. Simply put, marketers need eye tracking. Perhaps you believe that the way the consumer’s eye moves across the screen is a design issue. Perhaps you believe that this goal is best accomplished by emphasizing the artistry of advertisements, such as the apocryphal Fibonnaci spiral that makes Apple’s logo so visually appealing. While design is certainly an important component in the effort to catch the consumer’s eye, the fact of the matter is that even the most beautifully designed content can be ignored or overlooked if it is not artfully placed and properly noticed. In short, marketers need a tangible, objective way of measuring the immediate visual impact of their content. If you want to figure out when consumers are turning a blind eye [sic], you need to get tracking. Eye tracking began as a method of gathering data for laboratory research. In psychological science, there is a long and rich history of using eye movements to draw conclusions about how the mind works. As the saying goes, the eyes are windows to the soul. At the turn of the 21st century, eye trackers were primarily large apparata that sometimes immobilized research participants into a posture not so unlike the unfortunate protagonist of A Clockwork Orange. However, as in so many fields, the last two decades have seen a dramatic technological revolution in the way that eye tracking is performed. The eye movements of a consumer can now be tracked in real time using comfortable, portable, inexpensive, and unobtrusive technologies. Using contemporary eye tracking technologies such as iMotions, marketers have the ability to aggregate data on where consumers are looking and when. This provides a window into the opinions and implicit biases that are buried deep below the surface, and wouldn’t appear in an interview or customer survey. The consumer’s eyes can tell you things about your product that they might not even know themselves. This data on the consumer’s visual and emotional responses, which may lie below the level of ready awareness, can then be utilized in a host of different applications. Possible uses for eye tracking data could include testing advertisements across print, television, and online platforms, as well as testing product packaging, branding, and messaging both in and out of stores. In essence, any time you want to catch the consumer’s eye, eye tracking can tell you if you did. In this small and rather juvenile example, by playing with your visual expectations, I exerted some measure of control over you. Now as every marketer has to learn, it’s impossible to force the consumer to do what you want them to do, to buy what you want them to buy, to look where you want them to look. No marketer can have complete control over the consumer, nor should they want to! But with eye tracking, at least you can prevent the consumer from having control over you. Knowledge is power. When you’re able to aggregate serious data on where the consumer is looking, when they look there, and how they feel when they look, only then do you become able to make decisions from a place of knowledge, rather than guess and wonder how the consumer will react. 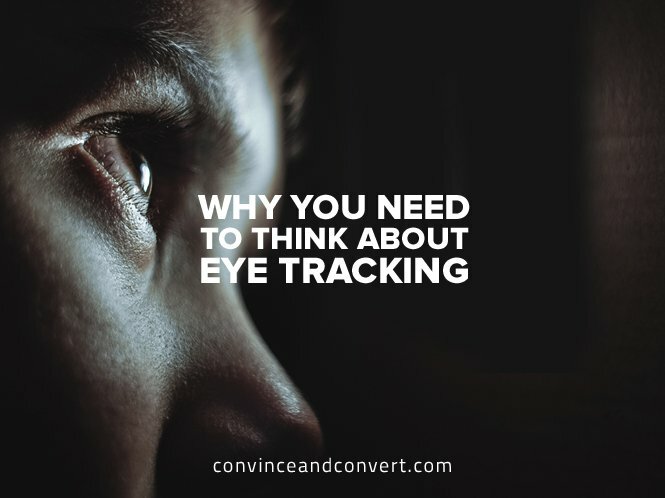 In the end, it’s time for you to start thinking about eye tracking. All eyes are on you to make the next move! If you think eye tracking deserves a closer look (I can go all day with these eye puns), check out the following infographic for helpful info on the science of the eye, technical specifications of eye tracking equipment, and best practices for eye tracking research. Philip is the Head of Marketing for iMotions, a biometric research software platform. Philip specializes in software and SaaS marketing, he believes data is the key to success, and he will go to great lengths to find the right insights. In his spare time, he's probably playing with his Rubik’s cube trying to beat the world record.